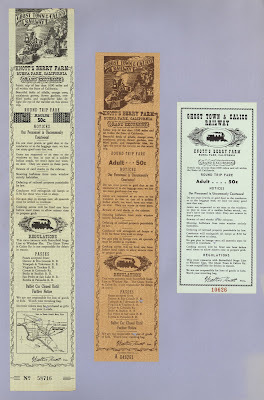 Time for some vintage Knott’s Berry Farm Tickets. 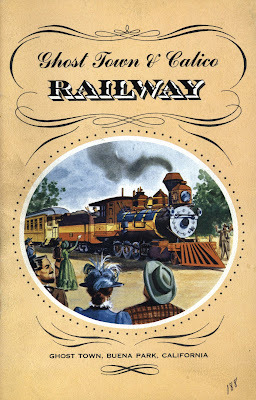 But first here’s the cover to the 1953 booklet that tells the history of Denver and Rio Grande narrow-gauge railway and how it ties into the trains at Knott’s. 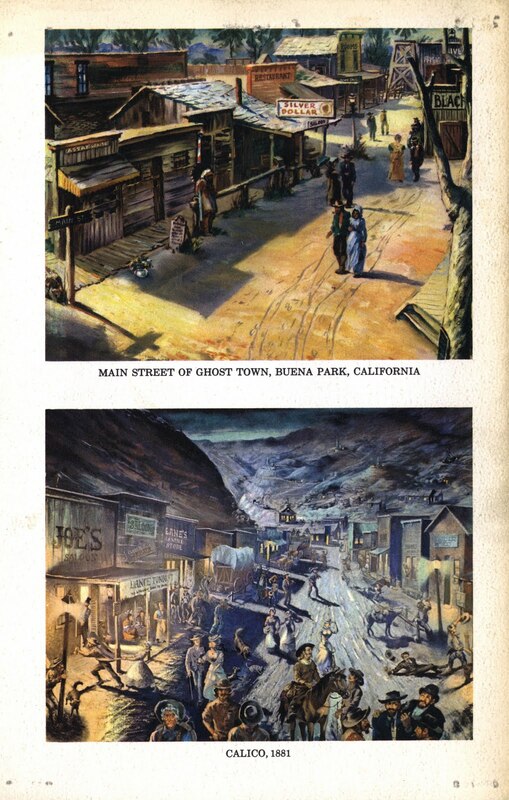 Come back on Bonus Sunday for the entire booklet (59 pages) there’s some great early photos of the trains at Knott’s and lots of neat facts and drawings. 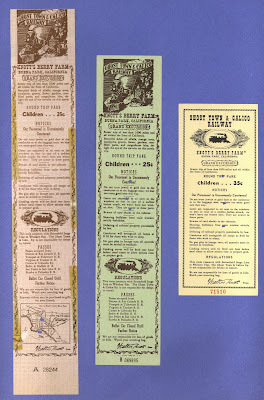 The Ghost Town and Calico Railway’s Grand Excursion tickets have always been pretty cool. They really go for authenticity; I think the different shaped punch marks are a nice touch. You can see the tickets got smaller over the years, the later version isn’t even on safety paper but at least it’s still only 50¢! The larger ticket is HUGE, these are scanned on an uncropped 18" by 12" piece of construction paper. The Child tickets did see price increase somewhere along the way. No gun play in the lounge cars! The back cover to the booklet, see the inside on Bonus Sunday. 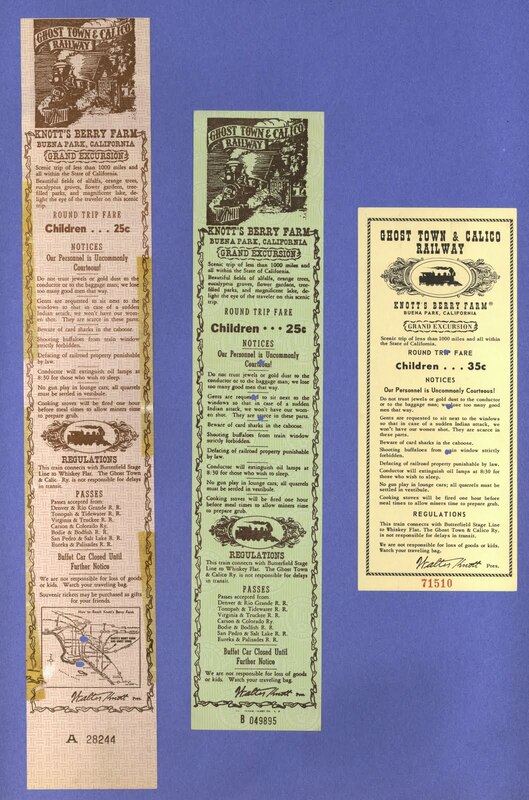 I'll bet that collecting Knott's tickets is a lot more challenging than Disneyland tickets! I'm always hoping to find an unused (unpunched) train ticket, but so far, no such luck. These are great. I have a set of the middle size tickets and a copy of this booklet. 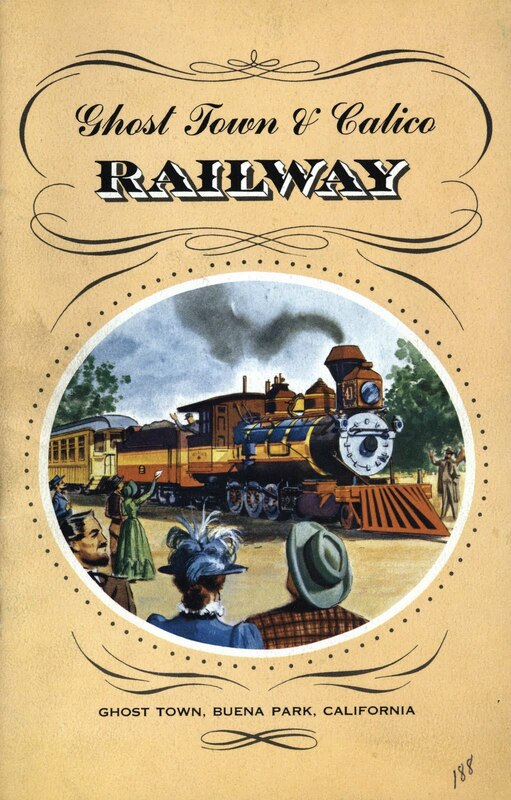 I have been talking with management about reprinting a condensed version of this, mostly the latter half of the book, which is the part that is the more about the history of the Knott's train. Good luck with getting Knott's management to do anything in regards to Knott's history. If it doesn't spin around at 300 feet in the air, it serves no purpose. I love your site...It is very informative. I have 2 Tramway tickets that are like the ones you have but they are worded different. 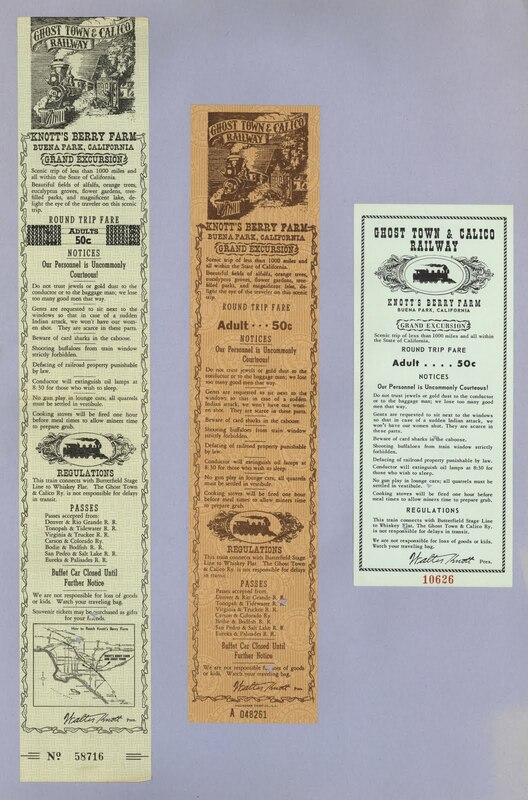 They are the Dillingham Safety Tickets but they say "Issued by Lucille Mining Co. One Round Trip Tramway to Calico Via Mill and Smelter Wall Street Canyon." On the stub part there is no price for the ticket printed but it does say "One Round Trip. Retain this Ticket" and they have Serial 099089 and 099090. Was wondering if you knew what time period these were used. Thank you for your informative page. I learned a lot.